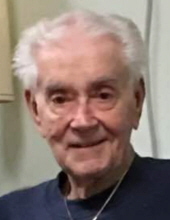 Alfred Alfonso Damiani, Jr., age 88, passed away peacefully surrounded by family on February 5, 2019 at the Royal Cape Cod Nursing and Rehabilitation Center in Buzzards Bay, MA. He was the son of the late Alfred and Maria (Costanzo) Damiani. Al was born on January 20, 1931 in Bronx, New York and was a long time Foxborough resident. He proudly served his country in the US Navy during the Korean War. He was employed as a Sales Representative for many years. He was the husband of the late Janet (Klahn) Damiani and the former husband of the late Joyce (Lott) Damiani. He was a member of the American Legion, Post 93 in Foxborough and served in the Vestry of St. Mark’s Church in Foxborough. He was a former member of the Town Committee in Foxborough and enjoyed cooking and coin collecting. He most enjoyed spending time with his family. Al was a loving and devoted husband, father and grandfather. Devoted father of Alfred Damiani and his wife Betty of TX, Steven Damiani and his wife Hilda of TX, Debra Reeve and her husband David of MA, John Damiani of OH, and Valaria Zaverucha of MA, Elizabeth Clark and her wife Kate Targett of MA, Christine Jill Clark-Mello and her husband Brian Mello of ME, and Jennifer Allen and her husband Kris of CT. Beloved grandfather of 15 and several nieces and nephews. Brother of Robert Damiani and wife Virginia of MA. Relatives and friends are kindly invited to attend calling hours on Sunday, Feb 10, 2019 from 1PM to 4PM at the Roberts and Sons Funeral Home, 30 South Street, Foxborough. A Funeral Service will be held on Monday, Feb 11, 2019 at 10 AM at St. Mark’s Episcopal Church, 116 South Street, Foxborough. Interment to follow at Knollwood Memorial Park in Canton. For additional information please contact 508 543-5471. To send an on-line condolence please visit the funeral home web site at www.robertsandsonsfuneralhome.com. In lieu of flowers, donations in Al’s memory may be made to The Wounded Warrior Project or Hessco Elder Services in Sharon, MA. "Email Address" would like to share the life celebration of Alfred Alfonso Damiani. Click on the "link" to go to share a favorite memory or leave a condolence message for the family.